The roots of Ondine date back to 1985 when founder Reijo Kiilunen released the very first Ondine album under the auspices of the renowned Finnish Kuhmo Chamber Music Festival. The label's initial mission was to produce one live album at the Festival each season. 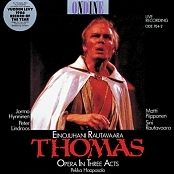 The fourth album, however, featured Einojuhani Rautavaara's opera Thomas (ODE 704-2), raising major international attention and opening the ground for overseas distribution. Kiilunen, who was running the Festival's concert agency and had begun the recording activity part-time, soon decided to devote himself fully to the development of this new business, producing and editing the first 50 releases himself. The Helsinki-based company has been expanding steadily ever since. In 2009, Ondine joined the international Naxos music group as an independent unit within the organization. Throughout well over 30 years, Ondine has released more than 600 carefully selected CDs, Hybrid SACDs and DVDs. The label's albums enjoy wide international distribution and are also available for digital download or streaming from all essential online outlets. 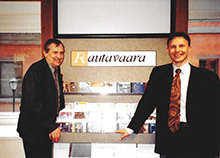 Composer Einojuhani Rautavaara and Reijo Kiilunen in Philadephia in 2000. Over the years, Ondine has established itself as one of the most respected labels in classical music, and its products have received numerous prizes at the Cannes (MIDEM) Classical Awards, the Gramophone Classical Music Awards, the BBC Music Magazine Awards, the International Classical Music Awards (ICMA), Echo and German Record Critics's Awards and Diapason d'Or de l'année. In a larger context, Ondine's history of success has played a part in the strong development of Finland's cultural visibility internationally, which has gone hand in hand with the economic and technological rise of the country since the mid-1990s. Ondine is proud to have shared in the forging of the Finnish "classical miracle" which is now widely recognized around the world.